Like many people my age, I spent most of my childhood huddled around my family computer playing Backyard Baseball ‘til my eyes bled. Swinging for the fences with baseball prodigy Pablo Sanchez, and striking out batter after batter with Tim Hudson using the fireball powerup. With my busy schedule nowadays, being in college and all, quite often I find myself longing to go back to the days of carelessly clicking away on Backyard Baseball. But with Backyard Baseball not being published on a true platform since 2010, my dreams have been shattered. All I can do now is hope and dream. And that’s exactly what I did. I present to you my dream list of MLB stars I’d like to see in a revitalized Backyard Baseball. Mike Trout is basically a given in this case due to his current level of stardom. Mike Trout is arguably the face of baseball and no Backyard Baseball reboot would be right without the Millville Meteor. Seeing his five-tool abilities flourish in the sandlot would be quite the spectacle. A spectacle only matched possibly by the stunning skills of a certain Pablo Sanchez. Rookie Sensation Aaron Judge has torn up this league and every baseball in sight. Launching bombs to the back walls of the stadium, to the left, to the right, and everywhere in between. It’d certainly be a sight to see just how far kid Aaron could launch one when placed into someone’s backyard. And with such a large stature, it’d be interesting to see how he would stack up against the rest of the kids. A Baby Bomber is a must have when creating a game that turns back the clock. The other rookie star to blast his way into the league would be another player that would be a great fit for this game. Pairing his power with his love of the game, he’d be quite the thrill to have. Bellinger brings a flare of fun to the game that puts a smile on all our faces whether it be launching bombs over the fences or cracking jokes about the game. The Dodger stud would be a perfect fit with the Backyard Baseball gang. I could easily explain this pick with two words: His Smile. Who could ever resist that big grin of his? And now picture that coming from a little version of Lindor. I would just have to see that big grin looked like on the tiny head of a kid. And Lindor is another player who gives his all on the field and is also able to take it easy and have fun every once in a while. He reminds us all that baseball is a game and it meant to be enjoyed. Another instance where I could explain myself with two words: Those Eyes. Everyone knows Kris Bryant has some of the most beautiful eyes in the league (see also, Kevin Kiermaier), so one could only easily imagine how cute little kid Kris would look in a Backyard Baseball game then. MVP and World Series champ Kris Bryant’s bat and glove would be a great addition to any sandlot team. 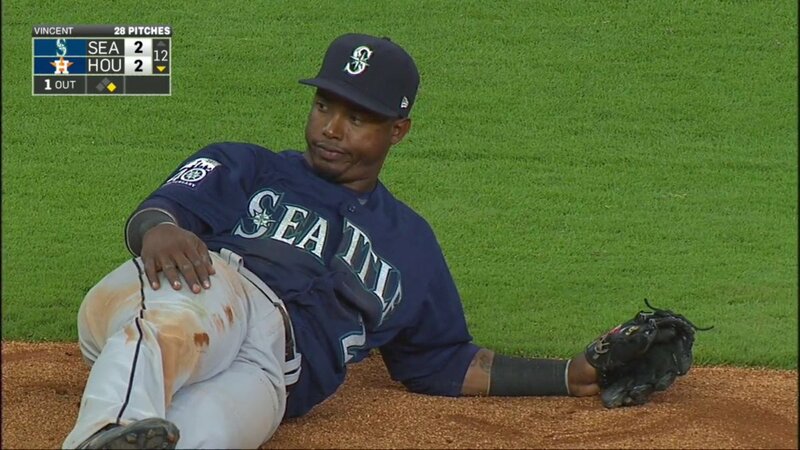 Jean Segura has been one of my favorite players over the past couple years. I’ve loved watching him flourish and come into his own as a player after bouncing from Milwaukee, to Arizona, and now finally to Seattle. Segura is great hitter and great player, but what makes him stand out and perfect for this game is his ability to have fun. Whether it be his reactions, or his walk-off celebrations, Segura is always able to put a smile on my face. And it also helps a bit that he reminds me of a kid at times. Another player, like Mike Trout, that would leave this game incomplete if he were left off the list. Bryce Harper’s fierce competitiveness and drive to be the best would be a real spectacle to see translated into little league. Then pair that with his skill, style, and last, but certainly not least, his hair, you’ve got quite the player. A player who would be awesome to play with out in the backyard. Having him and Pablo Sanchez go back-to-back would be enough to make me faint. Had to throw a catcher in here and Posey is the perfect candidate for this spot. Posey’s leadership on the diamond is something every little league team needs if they’re looking to succeed against the likes of Kenny Kawaguchi and Achmed Khan. He’s got a passion for the game that’s hardly matched by anyone and has served as one of the faces of the MLB for the past few years now. It’d be a crime to leave him out. Okay…I’ll just get this out of the way now…”He’s the size of a kid!” Alright done with that. Now for a bit more of an analysis of this choice, all you really need to know about Altuve to understand why he’s a perfect fit is his fun, upbeat attitude. He’s always got a smile on his face when he’s out on the field. Probably because he knows he can outhit and outrun practically anyone out there. Since we’re dealing with video games here, a great comparison for Jose Altuve would be Monty Mole from Mario Super Sluggers, except with more power. So one can only imagine how great Altuve would be out there on the field. This pick is more of a personal desire than any of the rest simply because I would just have to know what kid Kluber would look like. Would he ever smile? Would he be a robot? Would the developer use a similar algorithm for him and Kawhi Leonard if they were to make a Backyard Basketball game? Who knows? Which is why it is driving me crazy that there’s no Backyard Baseball game for him to be. I want to pitch a perfect game with kid Kluber never smiling. Is that too much to ask??? Carlos Martinez is another one of my favorite players of the past few years. He’s got an air about him that is just so entertaining to me. He’s got skill and a great personality to go with it. His antics on the field or in the dugout, like his pyramid that he protected with his life, always bring a smile to my face. And not to mention all the crazy colors he likes to dye his hair. Maybe it could be programmed that Martinez’s hair changes color as the game goes on. That could be something. Either way, he would have to be in the game, regardless of what color they make his hair. I feel like any player with the nickname “Pickles” has to be in this game. There’s gotta be some law about it somewhere. Sonny Gray is one of the most consistent pitchers in baseball and always fun to watch. He may not be as known or dominant as other pitchers in the league, but I feel that Sonny Gray fits the Backyard Baseball vibe perfectly. Plus he still looks like a kid too. He’d fit right in amongst the best of them. Marcus Stroman is another player, like Gray, who fits the Backyard Baseball vibe perfectly. He’s got the skill, the passion, and the style that would translate flawlessly. With his whole HDMH (Height Doesn’t Measure Heart) campaign, he embodies exactly what Backyard Baseball is about. It would be a crying shame if Marcus Stroman was left out of the game. Just look at that hair and that smile and tell me he doesn’t deserve to be characterized. So that’s my list. And yes, this is what I do when I put off studying.